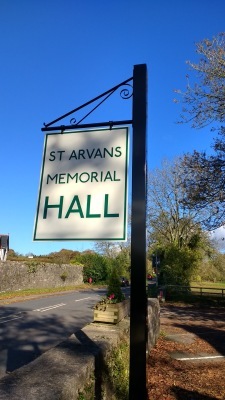 St Arvans is a village in an area of outstanding natural beauty in the Wye Valley, between Chepstow and Tintern. The hall is conveniently located on the A466 and has a prominent sign on the road side. For Satnav purposes, please use the post code NP16 6DN but please also confirm the instructions in conjunction with the details on the Contacts and Directions page by clicking here . There are two halls, separated by the kitchen and toilet facilities. They can be hired separately or as one unit. The front hall measures approximately 11 x 7.5 metres with the addition of a stage, 5 x 2.5 metres. There are fixed benches around the walls, providing useful extra seating but this does reduce slightly the floor area quoted here. The rear hall measures 12.5 x 7.5 metres. Less mobile users have access to the hall through specially adapted doors to the outside and a separate toilet. Cars can be parked very close to the hall. The kitchen is in the middle of the hall and serves both halls efficiently. There is a microwave, fridge, oven with timer, two sinks, kettle and water heater for hot drinks. There is a good supply of crockery and glasses. Cutlery is available too.